I like animals as philosophical metaphors … hence we cannot forget the “Hedgehog and the Fox” ! How a thinking person views the world? Without examining what qualifies one as a “thinking person,” I analyzed your four categories to determine where I fit. I would like to think I was DaVinci-esque, but had to acknowledge my default view always goes to an evolutionary perspective. Of the four categories, that probably fits best under the category of science, though I do not think of myself as a scientific thinker. When I clicked on the link to Wilson’s book, I was intrigued to see it had an evolutionary slant. Thanks for the good recommendation. And a perpetual feast of nectared sweets. I enjoyed this though provoking read very much. Thank you. Psst… I do believe that is a Harris Hawk, rather than a Red Tailed. But that’s a very mute point, the battle is still worth pondering over, and must have been awesome to see. Thanks for posting! Thanks for the note–and the head’s up on the hawk. The shot on the post is not mine, just a stock image I used to illustrate the post. (I try to use my own photography when I can…but I’m not a nature photographer.) 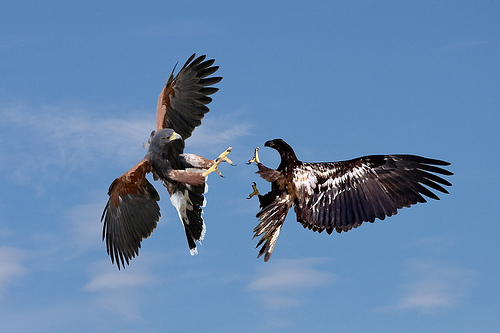 I’m not familiar with the Harris hawk, not, I think, a north American bird. All that aside, thanks for reading and the note. I’m glad you liked it. Yeah, I think South America, and I thought maybe it wasn’t your photo, but if it was I was JEALOUS. 🙂 Still a great read though. bookmarked! !, Ӏ like yoսr wweb site! The site is wordpress.com and I’m using one of the standard templates. WP hosts it for free.